Like many of you, I stress out about dinner time. Many people think because I work at home that I have all the time in the world, and that I could always put a home cooked dinner on the table. Personally, I would love if this happened, since it wouldn't mean we are sometimes eating at 8 or 9 at night after finding something quick to fix. It's even worse when I find this amazing, simple recipe on Pinterest that I think everyone in my family will love. As I'm getting the ingredients out and ready to go, I find out that I have to make a homemade marinade that has to sit in the fridge overnight. Of course this is definitely what I want to see when I'm in a hurry! They may be great for a weekend meal, but who has the time for things like that on weeknights? As you can guess, time is my biggest limiting factor and has recently been the reason I haven't cooked as healthily as I used to for my family. Since I am back on my weight loss 'lifestyle' (I hate the word diet), I have decided I must find the time for cooking home cooked meals, leaving me looking for shortcuts that are healthy and tasty. One of the ways we talked about doing this is grilling, especially since I used to love grilling vegetables and different types of meat on my mother's grill. I can't tell you how excited I was for my husband to purchase our first grill. All I needed at that point was a quick, easy way to cook meat that was fast and didn't add too many calories to our food. This is where I found what I think may be a busy woman's best friend – French's Flavor Infuser Marinades. Like me, you probably know French's from their selection of mustards. I have used their mustard for seasoning and cooking, but had never tried any of their marinades prior to this review. For me, this was a whole new experience with the brand, and I have to say I was pretty excited when French's asked me if they could send some products, free of charge, to review. What makes the Flavor Infuser Marinades so innovative and different from every other marinade on the market is the infuser. While I had never heard of it, the concept is used by most professional chefs, who use an infusing tool to inject marinades into meats, allowing them to marinate meat faster and more thoroughly in a restaurant setting. With the unique design of the bottle, the Flavor Infusers are designed to insert the tip of the bottle into your preferred meat, distributing the marinade thoroughly throughout. Because it is injected, rather than simply soaking in, you can drastically reduce marinating time, bringing it from hours to a short ten minute time span. In other words, it makes properly grilling meat a 30 minute affair from start to finish, saving you valuable time! With four fun flavors – Caribbean Jerk, Zesty Italian, Classic Steak, & Sweet & Tangy Teriyaki – you can find the right flavor for just about every meal with these infusers. The only catch is that you cannot reuse the bottles. When you cook, you need to accept that you will be throwing away some of the bottle, or cooking 3-4 pounds of meat in one go. Before I really thought about it, I couldn't really think of any reason why I wouldn't just put the top on it and use it later. With a bit more thought, however, I realized that this was not a good idea at all since the injecting method also means that the tip is contaminated from the raw meat. While this is perfectly fine for meat you are going thoroughly cook, it isn't a good idea to leave it sitting on something, especially on a marinade you are planning on using on other meat! With the proper amount of planning, and some willingness to enjoy leftovers, however, you can avoid most waste. Before I started cooking, I asked my husband which of the French's Flavor Infuser Marinades he wanted to try first. I was really surprised how quickly he said the Caribbean Jerk. Looking at the information I found online, I was surprised to see this was the most allergy friendly marinade out of all the choices. It is gluten free and free of all the common allergies, such as soy, wheat, and peanut. While most things seemed to recommend it for pork, I am not a huge pork fan. While I do cook with it every once in a blue moon, I much prefer chicken. After getting our chicken trimmed and cut into friendly serving sizes, I started using the infuser in the meat. I was surprised at just how easy it was to use. I thought it would be difficult or a choice, but just as it advertised, it was super easy and mess free. The hardest part was waiting the ten minutes for it to marinade. Luckily, the ten minutes went relatively fast, especially with a hyper dog who had been in the house all day. As you can see, the results from the grill looked rather delicious! The best part, however, was the flavor. I wasn't really sure what to expect from the Caribbean jerk, but it was a mild, sweet flavor. In my opinion, the best part was how juice the chicken turned out. It by far was the juiciest chicken I had ever tasted! What surprised me even more was when my husband heated up the leftovers the next day – it was just as juicy, after being REHEATED in the microwave! From what I have seen so far, the French's Flavor Infusers seem to really make a difference! I won't lie, I was really looking forward to using the French's Flavor Infuser Marinade in Zesty Italian. We had the chicken already prepped from the night before and were ready to see how this marinade tasted. Like the Caribbean Jerk, this marinade is also gluten free, making a great choice for those who are on this type of diet. As the grill was pre-heating, I started infusing my chicken with the marinade. I found that this marinade was a bit thinner than some of the others, which is not a bad thing. It seemed to really soak into the chicken. Before I walked away to let it sit for ten minutes, I also spread some of the extra marinade on the top of the chicken, hoping it would give it even more flavor. Once it was finished marinating, I placed our chicken pieces on the grill. When I first flipped the chicken, I knew this was going to be a delightful meal. One of the pieces of chicken accidentally stuck to the grill, showing off the lovely juiciness in the center. It had to be the hardest wait out of all the meals we had cooked. After finishing, however, we very quickly cut into it in the house. While all the marinades are delicious, this has to by far be my favorite. Out of all the Flavor Infuser marinades, this has the most kick, giving a nice mixture of sweet and spicy. I could easily see using this marinade all year round with its great flavor. I'm actually hoping the next time I purchase it to try it in the oven, seeing I can get the same results there! When I first opened the Classic Steakhouse marinade, I will be honest, I was nervous. I've always messed up cooking steak. Even those fool proof recipes on Pinterest I have messed up. To me, if the French's Flavor Infuser Marinades were going to fail, it would be here with my steak cooking skills. After trimming the steak, I put the infuser tip in the meat and got to work. The meat was quickly getting a nice, dark color, letting me know that the marinade was soaking into the meat. After what seemed like a long ten minute wait, we threw the steaks on the grill. With the thin cuts I purchased, they actually cooked faster than I expected. So much so that my husband was worried I messed up the steaks – again. To our surprise when we cut open the meat, it was juicy despite being cooked to a medium-well finish. Of course, the best part was the flavor! My steak actually tasted GOOD! I think in all my years of cooking, I had never been so excited! I actually had found a marinade that made even MY steaks taste good! To test out the Sweet & Tangy Teriyaki, I decided to try something a bit different and see how this marinade works with ground beef. 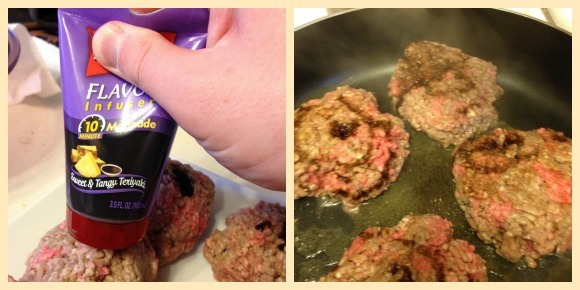 I had some extra ground beef in the fridge and thought burgers would be a perfect test. Awhile back, I tried burgers with marinade infused in the middle of the burger, giving the burgers a nice, juicy flavorful treat in the center. While I had no clue how to do it before, the French's Flavor Infuser Marinade seemed made for projects like this! Wanting to get the most flavor, I rolled each of the burgers in a ball and then infused the center of the meat with the marinade. With ground beef, you can see the meat expanding and taking in the flavor. As with the others, I had the burgers sit for ten minutes before taking them out to the grill. Now, because this was my last marinade to test, Murphy's law decided to kick in. Just as I was about to put the burgers on the grill – something on the grill broke. While I didn't really get what happened, I did understand my husband telling me he would have to fix it later, leaving me quickly making dinner on the stove. While it did take a bit longer, I ended up with the most wonderful hamburgers. As you can see from the pictures, the burgers were very flavorful, even the ones that were closer to well done! Best of all, the marinade worked just as planned, giving everyone a nice little flavorful treat in the center of the burgers! I have made and purchased quite a few marinades over the years but I don't think anything I have tried has topped this marinade for speed and taste. I don't think I've ever had chicken this juicy! I think the secret to this marinade lies with the infuser, although the ingredients used to make the marinade certainly seemed good as well. One thing is for certain, this marinade is now becoming part of my budget and I'm planning on stocking up the next time it's on sale. This marinade may very well become my life saver for those busy days when I don't have time for lengthy preparation, especially since my husband feels comfortable using these as well. So, what do I think of French's Flavor Infuser Marinades? In all honesty, I'm not sure an A+ is a high enough rating with how these seem to make just about any type of meat taste. Either way, I don't think I could recommend this marinade enough! If you love to grill, it's a must try in my book! 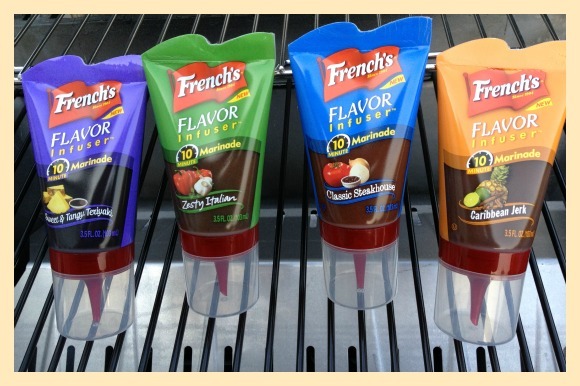 Want to try French's new Flavor Infuser Marinades for yourself? Unlike other products that are sometimes hard to find, these marinades can be found in your local grocery store or big box retailer. As a matter of fact, they were displayed at my local Kroger last time I was in the store, and I'm planning on stocking up. With a 12 month shelf life, why not? Since they were in the aisle with all the other marinades, I'm assuming that will be where you can find them in your own preferred store as well. They are currently retailed for $2.99 a bottle, making them a bargain for quick meal nights! 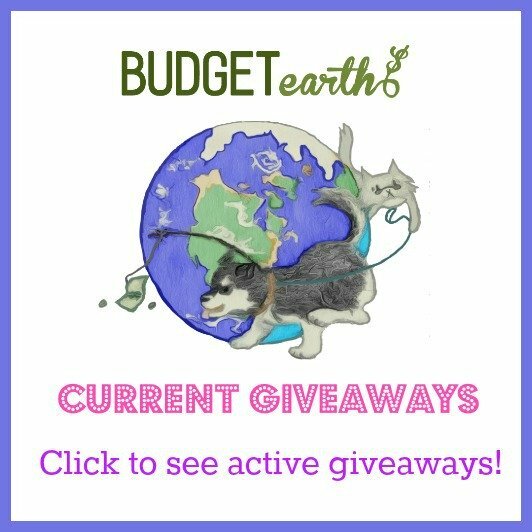 Disclosure: Budget Earth did not receive compensation for this review but did receive free product for review purposes via French's. All opinions on this product are my own and may differ from our readers' opinions. These sound like a great idea and something that really adds to the flavor of the meat. Just the fact u can cut ur marinade time to 10 minutes is really great. I would love to try the Caribbean Jerk flavor. I really like when you can infuse flavors into the meat you are cooking or barbequing. French's is a quality product, so I have no doubt their flavor infuser marinades are simply delicious. I want to win this! The throwing away of the container would be a negative but would be good for slow cooking/smoking large pieces of meat or lots of chicken pieces. I wonder if you can infuse and then freeze to cook later? Yes, I saw somethign on their website about it. They recommend if you are going to do it for more than ten minutes put it in the fridge or freezer. They look so yummy. My family would love them. And it would be great to try some new flavors. Thank you for the great review. I didn't know French's made this product and I have never infused any meat. This sounds so easy and the flavors, delicious, I am going to try it. I was nervous at first but it really is super easy! Oooh! Those marinades look mighty TASTY! I would LOVE to tickle my tastebuds with the Caribbean Jerk or the Sweet & Tangy Teriyaki! YUMMY! This seems like the perfect solution to getting the flavors into our everyday meals.I would like to try the Sweet & Tangy Teriyaki and then the Caribbean Jerk for my chicken.Too bad i do not have some now. These look so good! I am definitely going to try them now, especially since a coupon just came out! I seen chefs on cooking shows use diffusers. The carribean jerk flavor is one I would love to try. I am definitely going to buy these marinades. We love to grill, living down here in FL, the house gets so hot when you cook inside. I love adding seasonings to our meats and this seems to be the perfect solution to my flavoring problem. We used the sweet & tangy teryiaki on a pork roast that I cooked in the crockpot. It turned out delicious! I'd loe to use this in an eggplant before putting the whole thing in the oven (or BBQ) to roast. Yum! Please tell me how it goes with the eggplant! My husband wouldn’t touch it but it sounds amazing to me! they all loook incredible! i cannot wait to try the classic steakhouse flavor. The Classic Steakhouse and the Zesty Itilian sound delicious. I can't wait to try these. I enjoy different flovors. I could live on anything Teriyaki, so I've been wanting to try the Sweet & Tangy Teriyaki. I love the way the flavor is applied, no mess. There seems to be a nice selection of flavors as well. OMG. I am So hungry now. These photos are too much. I love the idea for this product. I have tried the Zesty Italian. I can't wait to try the Classic Steakhouse flavor, and my daughter wants to try the Teriyaki. The Zesty Italian was o.k. but I don't really like Zesty Italian flavor in the first place. I'm still excited to try the other flavors though. Okay… so it looks like it's meant to be reusable or rather, used more than once… but how do you do that when you're putting it inside raw meats?? Angel, I had this in the review but I want to clarify – never EVER use the applicator more than once. Once its touched the raw meat its a no go. It contimates the rest of the marinade. Its okay to do in one batch since you will be cooking that meat, but saving it would mean for bacteria to cultivate. I love to grill all summer long and love using mariandes and spices to add flavor to my dishes. These are awesome and would be perfect for my grilling! These sound delicious. I love the Idea that meat gets flavored without having to sit in marinade very long. I love this idea, it seems like a really good time saver. I can't wait to try some of these. While I was reading I was already coming up with ideas for a couple of the flavors. I definitely want to try the zesty Italian with some chicken. We love to grill. These sound like a wonderful way to add flavor in a very easy way. We usually grill out at least once a week in the summer and I would love to try these out. I agree with you, this is a great way to add a lot of flavor in a little bit of time. Plus it is doing so in a healthy way, without a lot of calories or fat. I think they sound wonderful. I have never tried this before,but I hope to soon. I think I would like to try the carribean jerk flavor first.You made it sound so good.It looks easy to do too. My husband and I love to cook together and try new products. The Sweet and Tangy Teriyaki sounds delicious! I can't wait to try them and thanks for the awesome review! What a nice selection of flavors! We would especially like the Steakhouse variety. This is such a clever concept for marinating your food! I loved your review! I have been eyeing these when I see them at the store and now the next time I have a chance I thing I will be buying one of each to find our favorite. Thanks! I have tried the Classic Steakhouse with steak and it was pretty tasty! But I am really looking forward to trying the Zesty Italian with chicken and the Caribbean Jerk with pork tenderloin! i have been looking at these…wondering how good they are….and seeing your review of them i thinking i will def be getting some to make this weekend 🙂 i'm on a fish kick right now so i'll be trying out the sweet & tangy teriyaki 🙂 thanx for the info!! I love the fact it takes 10 minutes to marinade. I also love the convenient injectors. No difficulty trying to load and clean afterwords. Plus a great choice of flavors. Wow the caribean jerky looks yummy. I will definately try since you were kind enogh to give us a coupon. I am going to buy this. Sounds so good!!!!!!!! I like the idea of an easy way to infuse meat. A person no longer has to mix up the marinade ingredients and then put in a syringe to inject the meat. All in one is a great idea. The four available flavors give you a variety to choose from. I cannot wait to try these. I am glad that you warned us that we have to throw the applicator and marrinade away after one use. I have a reusable washable injector so I will put the marinade in it and save the unsed portion(in the unused applicator or another bottle) for future use. That is actually an awesome idea! I need to buy one of thoes for myself. I had throwing away unused product, especially when they are tasty! Another new product I haven't seen before. These marinades will difinitely be on my shopping list. Thank you for posting what sounds like a great new food staple. They really are amazing! I need to clean out my pantry to make room for more! These marinades look great. We are always looking for a new way to cook/grill. Can't wait to try these. These sound so good. I would love to try them. I've seen this at the grocery store and was curiuos. I didn't buy it because I didn't know which flavor to get. Thanks for the review. I'n going to start off trying the steak marinade. They all sound pretty good. THESE MARINADES LOOK AND SOUND GOOD.I WOULS TRY THE CLASSIC STEAKHOUSE FIRSTON A STEAK, I WOULD TRY THEM ALL ..THANKS FOR SHARING –THIS IS FIRST I HAVE HEARD OF THEM..
All 4 flavors look very good!! I've never tried them before, but would love to!!! I will not be trying these. The ingredient lists are down right scary. HFCS adds no flavor, only "sweet" to the mix. There would be far fewer health problems in this country if people paid more attention to what they put in their mouths than buying something out of convenience. Personally, I think HFCS, while not my favorite choice of ingredients (I much prefer cane sugar), is alright in moderation. There have been quite a few studies lately that have shown it really doesn’t have any harmful effects. HFCS is just as dangerous as any other sugar. Personally, I am more afraid of Splenda and most of the artificial sweeteners. WIth some of the studies out there I’m really surprised they haven’t been taken off the market. Also included a great article on on the confusion of HFCS from one of the About.com nutritionists. Sugar and HGCS are both dangerous for your body in high quantities. I would love to see French’s make this product with natural cane sugar though. I much prefer the taste and it would mean my Father in Law could have it (he has a corn allergy). omg i have tried them all they are great! they are easy to use and easy to prepared a meal with. 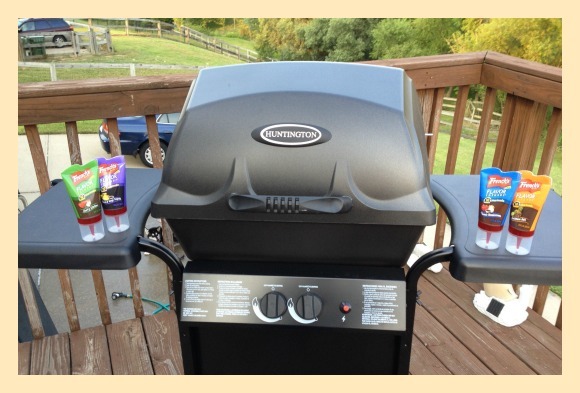 We love to grill any time of the year and I am always looking for new ways to shake things up. I need to keep my eyes open for these at the store. French's has always had good quality products and I'd certainly give them a try. I like this concept. If professionals are using this method, I am interested! I love Carribean Jerk too! Looks so easy to use and lots of marinade flavors. I would try the carribean jerk for my chicken. Because it is injected, rather than simply soaking in, you can drastically reduce marinating time, bringing it from hours to a short ten minute time span. Time savings is very important to me. 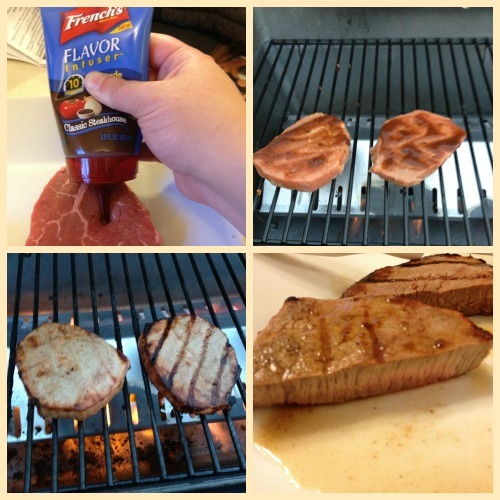 I recently tried the French's Classic Steakhouse on some sirloin steaks we grilled last week. I've used other brand powder marinades but you had to add your own oil,and vinegar, Though they were good, it was nothing like these infusers. The flavor was wonderful! and so much easier to use, I am definitly looking forward to trying the other flavors. i have got to try these! my family & i hate bland boring meat! i will be looking on pinterest for ideas about this!! This is something I want to try. We love to grill. I think I will be trying the Classic Steakhouse first. I wish these were available in Mexico! We do have French´s products but no marinades. Maybe I will ask my local grocery store to carry them. I love the shape of these bottles. I really enjoyed reading your review and seeing your opinions. I have wanted to try these for a while. I am so glad I found these on here. It is going toward the end of summer and next week end is labor day I can not wait to get some and try it on a variety of meats done on the grill. i am leaning towards some blue fish with the zesty italian done on the grill… Will have to let you know how it comes out ..
Make sure to come back and tell us how it goes! I would love to try it on fish! Yum! You have my mouth watering over the juicy descriptions and tenderness. I was amazed to see the French's name with marinades, but, now, just want to try them. My family uses Italian dressing a lot, and I would love to see how this compares. My chicken could really use sime help…the French's Flavor Infuser Marinades: Caribbean Jerk sounds like something my Hubby and I would both enjoy. It looks so easy to use too and when I'm in a hurry that helps a lot….thanks for the review of this yummy product. I love the new idea you have for marinating meat. I can't wait to try the chicken one. I love to Grill,and would like to try some. I am interested in trying these. They look yummy and easy. I also like the fact that they can be used on different foods. I haven't seen those at the store yet but I will definitely be looking for them now. I never think to marinate meat too far ahead of time so the infuser would probably be a great help! These look super! We are always misplacing our barbeque tools. I relly would like sturdy stainless steel tools to use when we barbeque which is very often,, Family and friends get together often.. It would be wonderful to have a place to keep them and store them so conveniently. These look interesting. I usually wind up marinating meat in a plastic Ziploc bag with some dressing or homemade concoction. But with the infuser, I'll bet the meat stays juicier after cooking! Thanks for this review. I have been thinking about buying some of this but was wondering if it was good. I will getting some for our next cook out. I've seen things like this but never tried it. And I never knew French's made some. I love how easy it is to use but wish there was a safe way for them to have a reuseable version. I want to try the Italian one first!! I am so glad I am not the only one who stays at time and sometimes can't get a fully home cooked meal every night. This incredible though! Hubby loves Zesty Italian flavoured anything, that would save me a lot of time on trying to figure out seasoning every meal, every time. This looks like such a smart and convenient product! I would love to use it the next time I cook burgers! would like to win cuz i would like to try them i have never tryed any of the flavores. I tried the steak marinade and it is pretty good. Got to try a new flavor next week. I think these marinades and everything else is going to truly make our meals DELICIOUS! I would really love to try these. I think its great you can marinade in only ten minutes. I love that they have a 12-month shelf life! Anything I can do to improve on chicken is a blessing. These sound really delicious and convenient. I know what you mean. I have tried alot of products that seemed too good to be true, and were! I am very happy it wasn’t the case with these! Gosh what a great idea with the builit in infusiors! We have used a kitchen injector before but it is such a hassle to clean up. With these, you just use and discard. I like the variety of flavors too! And they last long too. I sometimes buy things and it takes me a while to get around to using them! I have purchased all of these flavors when on sale with coupons and got them for next to nothing but I have yet to try them so thank you for the great ideas and the great review. What a neat idea this is. Looks like there's not messy clean up involved either. Gotta love it! I would just diespense the marinade into my own injecter if I'm not going to use all of it at one time. This way the tip of the marinade dispense4r woul not get contaminated by the raw food. I always imagine whey something like this was not on the market. I am getting all of these in my homw. These sound really good, I would use the zesty italian on chicken breast or steak.Anything that makes dinner time easy. These are GREAT! Lots of flavor and they make the meats tender! MMMMMMM. nothing better than marinated meat from the grill . These infusers sound really good and I cant wait to try them. I've tried the terriake, it was really good. I would love to try the other flavors. Carribean jerk sounds so good. I had seen these in the store, but was unsure about purchasing them. After reading your post, I will certainly give them a try on my next shopping trip. I have actually never used any kind of injector but these seem like they would be easy and quick to use with little clean up. Thanks! I'm not really loving the fact that you end up having to waste product since these are for one time use. I assume there MUST be a way to get multiple uses but it would probably be messy as hell and time consuming. I assume that you can twist off the top prior to use, empty half and store it then when done with the tube wash it and put the leftovers back in. OR if you are a planner like me, when you buy in bulk before freezing you can inject all the meat so that it is ready when it defrosts and you don't waste any product. Gosh I am cheap lol. My boyfriend doesn't like these type of things. So one night I wanted to try them so I got the teriyaki and used it with a chicken that I got. He actually loved it so now I will be using them from now on!! I had never heard of these infusers before. Wow! They are so much easier than my way. Old fashioned mix up and try to inject with poking a hole and filling. It works if you do it right but a hassle. This sounds so much easier! The best marinades are citrusy I believe. I also like BBQ. This looks like a great way to quicken the process of marinating meats and chicken…I would love to try the Caribbean Jerk flavor! Great pictures by the way! I think these are great and so easy to use with no mess. I would like to try Zesty Italian on chicken. I have never heard of these infusers, but will definately be trying them this weekend! We love to use marinades and anything that will cut time and still have great flavor is a keeper in my book!! All the flavors sound delicious! I would probably lean toward the Teriyaki, but I know my fiance would want the Italian! I really want to try these! I am certain we would use the whole bottle in each meal, since I have to cook enough to feed two teen boys, as well as have enough left for hubby's lunch the next day! My husband loves to grill. This sounds like a great product. I will definitely look into adding this to our routine so we can have a more flavorful result. They all sound wonderful and so easy to use. I love to BBQ and these will be great to add flavor to all kinds of meat. I might even try the zesty Italian on veggies. I had a coupon and used it on Sweet & Tangy Teriyaki for a pork loin roast. Walmart only has the Teriyaki and Zesty Italian. I will probably use it on some chicken at the same time so as not to waste. Yes, I do it in a large quantity to avoid waste. Its the only thing I don’t like about the marinades but I understand WHY it has to be tossed too. I found that marinading the meat and then tossing it in the freezer works well too! I love the product name Infuser! Zesty Italian would be my French's Flavor Infuser of choice! I really like all the information. I have heard of these but have been unable to purchase as of yet. My problem arises because of the different allergies/intolerance to certain ingredients so most marinade I have to make myself to avoid this. I know all about allergies! I was bummed my father in law couldn’t try them since he has a corn allergy! I grill out and also use an outdoor smoker often. I think these Infusers could add something new and exciting to our standard fare. Yummy! Every one of these marinades sounded absolutely delicious! I didn’t even know French’s made marinades! This seems like a really good idea. Do you know where these will be available…I didn't see them in my local grocery store. I have seen them at Kroger, Wal-Mart, and Meijer. What stores are in your area ? The Classic Steakhouse would be good for my t-bones on the pit and also the Caribbean Jerk would be awesome on my smoked pork chops. They all look delish. Would love to try the Teriyaki one on chicken or pork. I think it was,a great idea for French's to come out with a product like this.I can't wait to try them,all the flavors sound great so i will definitely try them all.I love teriyaki so i might try that flavor first. I often wondered how i could get great taste into my meats and now this! I am so excited to try this! AND your pics look delish! Now im hungry lol! These look and sound yummy. I thank I will have to use the Zesty Italian for my chicken. These marinades look very tasty. Thanks for the interesting and informative review! I love the fact that it is allergy and gluten free!!! I would love to try them all. thank you for reviewing! 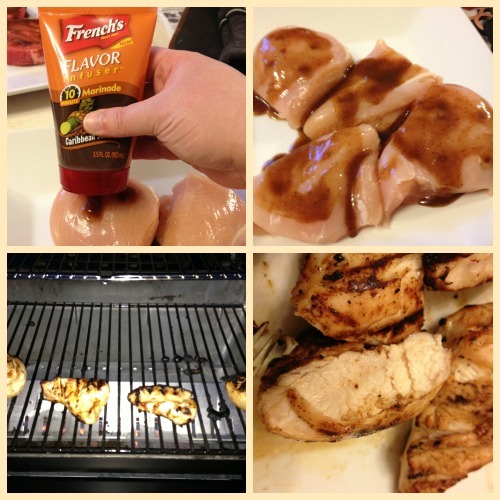 I have not tired French's Flavor Infuser Marinades yet but I would love to! I would most love to try the Sweet & Tangy Teriyaki first making a nice Shrimp Stir Fry! I am truly glad I came across this. I saw the commercial for these and thought, "what a great idea!" I will definitely try these out next week! These are awesome my husband always has to make the dinners that involve flavored meat Now i can do it as well! Oh man, I missed this giveaway. I hate to make marinades so this is any easy option. I wonder do they have honey mustard? I love to put that on salmon. Thanks for the review…I think about trying these everytime I see them in the store. I have seen these in the stores but have been sceptical on buying them. After reading your review on them and how yummy the outcome looks, i have to try them. The zesty Italian flavor sounds delicious! Thanks for the review. These marinades are so interesting! I've been seeing these in my grocery store but never considered trying them. i think next time i go i will definitely grap some.